Since Steve Yzerman took over the Tampa Bay Lightning back in 2010, the team's focus at the NHL entry draft has seemingly been on skill, skill, and more skill. That changed a bit this season. Instead, the focus was on two-way, lower-ceiling players who have that magic 'grit' factor. The Lightning didn't really swing for the fences with their picks (Dennis Yan might be the exception), but instead went for guys who they view as likely to turn pro as bottom/middle-six forwards. Some commentators championed this 'safe' strategy, but a quick look at historical trends suggest that it might not be so safe at all. The "tougher to play against" narrative is something that has been mentioned time and time again with reference to this team over the last year or two, so it didn't come as a total surprise to see Yzerman & Co. select players who might fit that bill in the future. Still, it's a marked shift in the way the team has done business at the draft historically. The player who sums up this contrast the best is probably Mitchell Stephens. Tampa Bay traded out of the first round on Saturday by dealing the 28th overall pick to the New York Islanders for picks #33 and #72. With so much talent and skill left on the board at the time, the deal made a ton of sense. The Lightning were going to get a really good player at No. 33, and add a mid-third round pick in the process. That's smart management. At No. 33, the Bolts took forward Stephens from the OHL's Saginaw Spirit. The 5'11" centerman, who some expect to play wing at the pro level, can be considered a bit of a 'reach' if you go by the pre-draft rankings. Bob McKenzie, who bases his rankings off conversations with scouts, pegged him as the 46th ranked prospect, while NHL Central Scouting had him as the 112th ranked (!) North American skater. Tampa took him at No. 33. It reasons to suggest that he might have been available for Tampa to select a little later in the draft, but that's neither here nor there. I'm not going to spend time suggesting that Player X would have been a better selection than Stephens. That wouldn't be fair to the player or my readers. The reality is that I don't know. All I know is that there were higher-talent players available in that spot. And that's not coming from me. The consensus among experts and scouts who come up with rankings says so. With all this in mind, it becomes clear that acquiring more scoring prowess or elite talent wasn't necessarily the goal for Al Murray's scouting staff. They wanted some grit. They wanted some sandpaper. They wanted two-way forwards who will make the Lightning tougher to play against. Those qualities are important, right? The team doesn't want to be pushed around. The team wants guys who can get in on the forecheck, battle, and come out with the puck. That will undoubtedly help with the possession game. So, it's not like the qualities Tampa was looking for in Mitchell are bad things. That's all fine and good. Callahan might not be a perfect player, but he was more than serviceable for the Bolts during the 2014-15 regular season. Here's the problem, though: Mitchell plays in Junior with the same style that Callahan utilizes in the NHL, and that's often not enough. Most of those lauded two-way forwards who do the 'little things' in the NHL weren't average scorers in Junior. That shouldn't come as a shock to anyone. Think of the talent pool like a funnel -- it starts out with a big base of players and continues to refine itself at every tier. Only the best players from Level X make it to Level Y. And only the best players from Level Y make it to Level Z. That's how the NHL became the best league in the world. Middle-tier players in Level X generally (and, yes, there are exceptions) can't compete with the top flight in Level Y. The Lightning's Callahan was no exception to this funnel rule; he was a fairly prolific scorer in the OHL, as evidenced by his point-per-game production rate during his draft season. He had the offensive game, the talent, and the scoring prowess in Junior to match all those intangibles that scouts love. And he was a late-round pick. Stephens, on the other hand, wasn't an offensive force during 2014-15 in the OHL. He put up fine totals and had a decent enough season, but it's not like he was among the best. The Lightning took him really early in the second round. The moral of the story is that it's hard to score in the NHL. Consistent Junior scorers like Ryan Callahan who don't possess that elite talent often have trouble translating their offensive game to the big leagues. Callahan won't ever be a point-per-game NHL player, even if he was one back in his Junior days. As the competition gets better, it becomes harder to score. What happens to a sub-PPG Junior scorer as the competition gets better? The totals are likely to go down even further. And that's where my issue with the Stephens pick (and Tampa's draft strategy as a whole, to be honest) stems from. It's a lot easier to translate from Junior scoring threat to two-way NHL forward. It's harder to develop offensive skills that allow a player to stick in the NHL. Great defensive players in Junior have a tougher time sticking in the pro ranks if they lack scoring prowess. I think we'd all be thrilled if Stephens turns into Ryan Callahan, but Stephens isn't Ryan Callahan. Maybe he plays a little bit like him right now in certain aspects of the game, but it could be hard for that defensive Junior game to translate to the NHL without a matching offensive skill set. I asked my Twitter followers for names they perceive as being in that 'Callahan tier', seeing as that's who Al Murray elected as his Stephens comparable. For the purposes of this little experiment, let's compare Stephens' draft year stats to Ryan Callahan's, Dustin Brown's, Mike Richards', Eric Fehr's, and Nick Foligno's. What's the common thread there? Each of those Callahan comparables, and Callahan himself, had offensive statistics to match their two-way play. The best comparable listed there for Stephens is Eric Fehr, who went on to explode offensively during his post-draft-year Junior seasons. I think the Lightning organization is taking a big risk in assuming or hoping that Stephens will do the same thing. Granted, that's not to say it can't happen. The Lightning have to hope that he develops more offensive skills as time goes on. That’s easier said than done, but I don't have a crystal ball. Maybe he is one of those rare late bloomers. The purpose here is to note that there's inherent risk that comes with taking guys who are already pigeonholed into that middle-six role. And, if you’re looking at an Eric Fehr-like finished product as a best case scenario, are the Lightning really getting full value at No.33 in a deep draft? Maybe Murray and the Lightning’s scouts know something and see something that the numbers aren’t highlighting, but it would be impossible to suggest that there isn’t a significant amount of risk that comes with this selection. And that risk is highlighted by history. A great study done by Michael Schuckers shows that a forward picked in the first round has a 35% chance of playing 200-plus games in the NHL. A forward picked in the second round has an 18% chance of hitting that mark, and a forward picked in the third round has a 17% chance. PCS%, otherwise known as Prospect Cohort Success percentage, takes a player and groups him with former prospects who were from the same league, have similar birthdays, produced similar point totals, and stand at roughly the same height. X% of that group (i.e. cohort) plays/ed 200-plus games in the NHL, and that's how we get PCS%. It essentially measures the probability of NHL success for a player's fairly equivalent peers. The folks over at CanucksArmy.com have done tremendous work on the subject. So, based on the tweet linked above, we know that roughly 15% of Mitchell Stephens' cohort plays 200-plus games in the NHL. And, based on the information from Schuckers' study, we know that 18% of forwards selected in the second round will play 200-plus games. Stephens was an incredibly high second round pick in what was supposedly a very deep draft, and yet his PCS% is even below the third-round forward bar. Remember that Callahan, Murray's Stephens comparable who actually had better offensive stats than Stephens, was a fourth-round pick in his draft year. 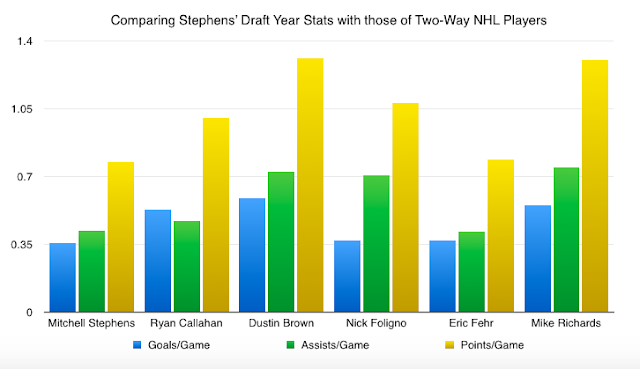 This isn't to say that Mitchell Stephens is a bad pickup for the Lightning. Plenty of guys with a 15% PCS% go on to have lengthy NHL careers. Maybe Mitchell Stephens is a guy who goes on to be the next Ryan Callahan or Dustin Brown. Again, I don't know. I'm just not sold on the idea that he was the best available option near the top of the second round. My argument is that a pick many view as 'safe' because of a perceived lower-ceiling, higher-floor skill set may not be so safe after all. And that's especially true at No. 33, a spot so close to the top of the draft board. The safest pick is often the most talented player, simply because of that funnel dynamic described above. There would have been a point in the draft where Stephens was the most talented player available, but it wasn't at No. 33. The Lightning took a risk by leaving relatively safer picks on the board. Sometimes what looks like a really safe draft strategy isn't so safe at all. Drafting for talent is never a bad option; the Lightning's history under Yzerman from 2010 to 2014 showcases that fact. As the old saying goes -- cream rises to the top. The Lightning are going to need Mitchell Stephens to defy historical odds and trends if they want to get full value out of their first selection from the 2015 draft. Here's hoping he does it.